Nuclear energy has a significant presence in Illinois, with 11 reactors spread across six plants. Together, they provide about 11.8 gigawatts of power to the entire state. That's enough for millions of homes -- or, as any "Back to the Future" fan knows, almost ten DeLorean time machines. But raw energy generated isn't the only important measurement. Paul Dempsey is a spokesman for Exelon, which owns the Byron Nuclear Generating Station. He says the plant has a capacity factor around 94 percent. This is a measure of the maximum amount of energy a power plant can put out, compared with how much is actually generated over a period of time. "It's a huge percentage for a large amount of power," he said. "Wind and solar are important. We definitely need a variety, but solar is in the 20 percent capacity factor range, wind may be 35 percent because we don't always have the sun. We don't always have the wind." In essence, nuclear plants generate electricity at a constant rate, and don't have to worry about storing it in batteries due to inactivity. Mark Kanavos is the Byron plant's site vice president. He says another advantage is that nuclear plants aren't as vulnerable to supply disruptions. In the case of the Byron plant, he says they have enough uranium on hand to keep reactors running for 18 months without interruption. "Coal piles freeze or coal doesn't get delivered, railroads don't run, wind doesn't blow, sun doesn't shine," he said. 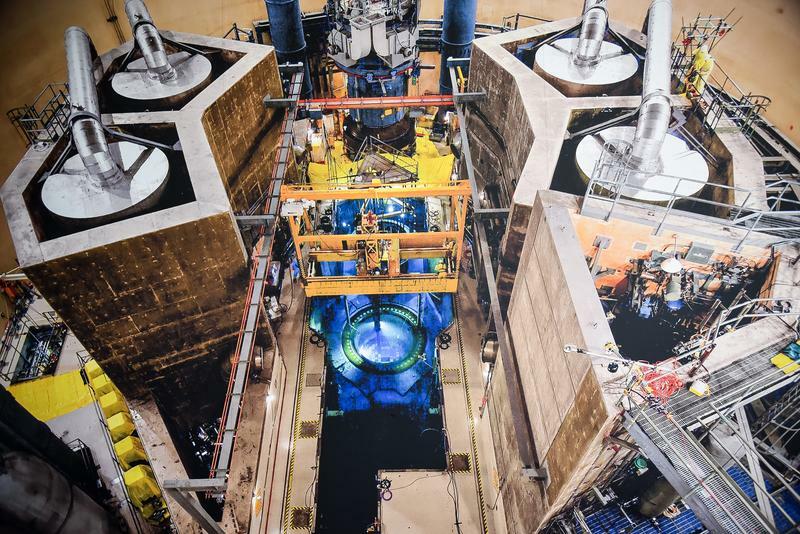 "(Nuclear) is truly part of our national trust, it's a constant supply of energy." 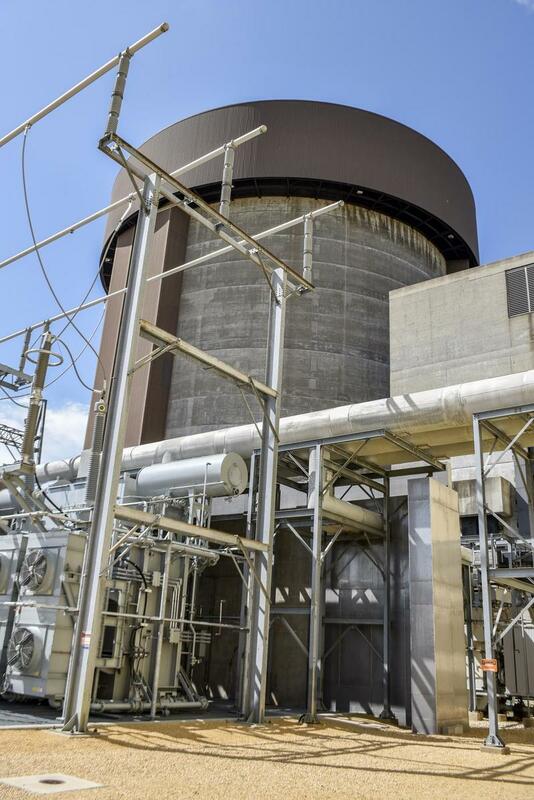 The supply from nuclear plants is enough to provide Illinois with 90 percent of its carbon-free power, and almost half of the state's overall power. But despite the output and production advantages, nuclear power faces several long-term challenges. The first is economic. Natural gas fracking and shale oil extraction have made these fuels cheap. Howard Learner is Executive Director of the Environmental Law and Policy Center, an ecobusiness and environmental advocacy group. He says the competition from cheaper natural gas hurt the profitability of Exelon's plants in Clinton and the Quad Cities. 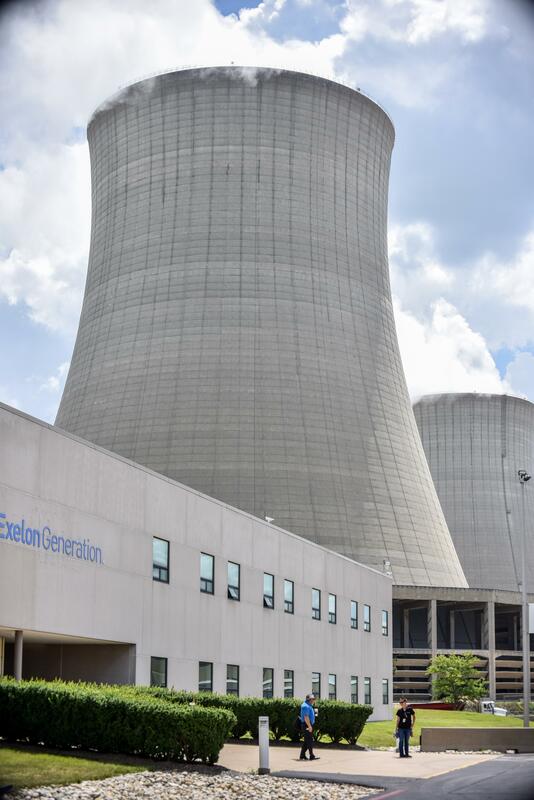 "The fact that Exelon said they needed public subsidies to the tune of about $2.5 billion tells you something about the economic competitiveness, or lack thereof," he said. These subsidies were part of the 2016 Future Energy Jobs Act, which also included incentives for renewable energy. Building new nuclear power plants can also be a hard sell to the public. Learner says they take about ten years to build, but could still be a net loss in profit even taking into account new designs. "There's a lot of R&D and technology development going on, and let's see what the engineers can produce. But what's out there right now for the new nuclear technology is not remotely economically competitive," he said. Kanavos at the Byron plant says his facility remains profitable because it makes use of two reactors, which generate greater amounts of electricity. Aside from the challenge of staying profitable, nuclear plants are also dealing with the issue of storing their waste. And the problem is not what pop culture would suggest. Much of the waste from a nuclear power plant is in the form of spent fuel. At a certain point, the uranium fueling a reactor won't be able to produce heat at a constant enough rate to generate power. When this happens, the fuel rods -- along with other irradiated objects -- need to be disposed of. Prema Chandrathil with the Nuclear Regulatory Commission explains what happens to the rods. "The rods will go in and they'll be covered with this water," she said. 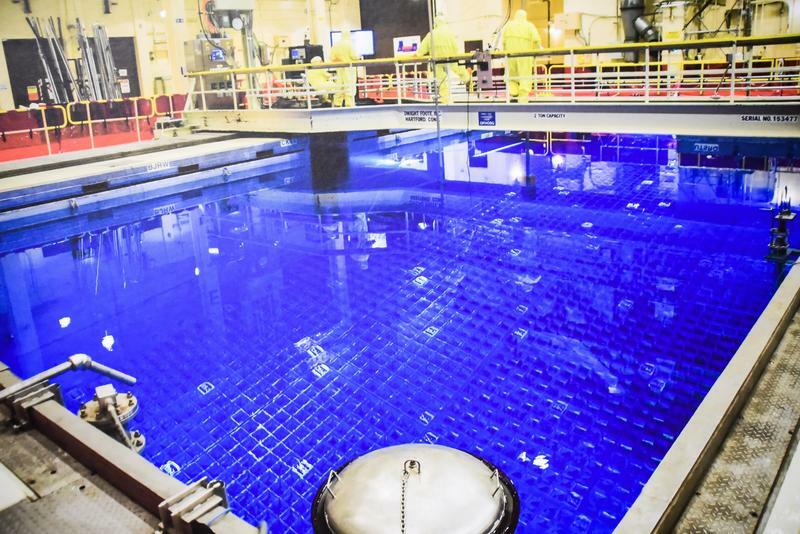 "They're cooled, they're protected, and there's shielding built into these spent fuel pools." The pools are usually at least 40 feet deep, so the water contains any radiation emanating from the spent fuel. There is also enough room to store hundreds of spent fuel bundles. But Stan Campbell with the Sierra Club's Blackhawk Chapter says the current problem is volume. "Each one of these nuclear power plants produces at least 33 tons of uranium dioxide waste fuel a year, not to mention all the hazardous waste that is produced because it comes in contact with the uranium oxide fuel. That has to be dealt with," he said. The fuel is safe as long as it stays in these pools, but the federal government hasn't determined a central location to dispose of waste in the long run. Because of this, power plants either need to build more pools or transfer the waste into large steel and concrete cylinders called dry casks. 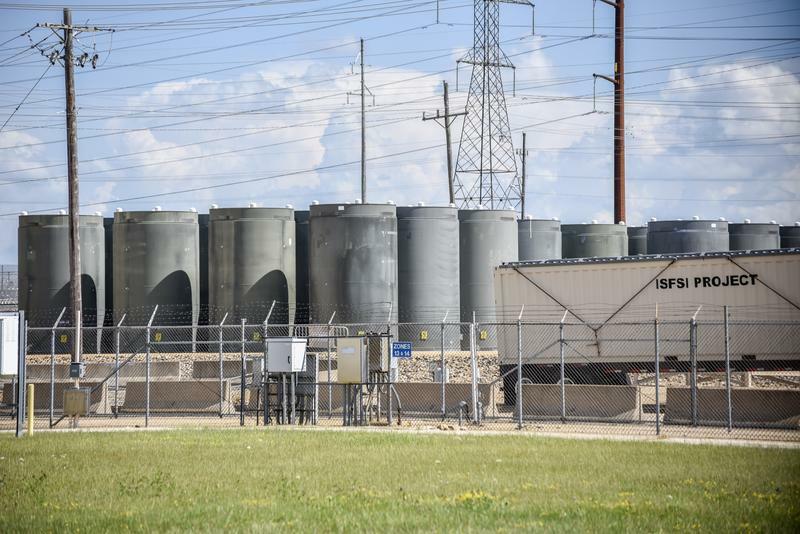 They're stored on site -- outside the power station or in dedicated buildings -- and while they continue to pile up, Kanavos admits it's probably the best interim solution until states or the feds designate a central repository. Overall, nuclear power plants provide significant amounts of electricity in Illinois. And while they face problems with profitability and waste storage, they remain a constant source of carbon-free power that current renewables can't provide on their own. In the next part of our series, Feeding the Grid, Peter Medlin looks at how some homeowners, business owners, and schools are embracing small-scale renewable projects.